The school-age branch of the armed services joined up with the Regiment for an exercise based at Ferry Reach in St George’s. The Junior Leaders spent the weekend honing their skills in the field and acting as ‘enemy forces’ as their older counterparts in the Regiment practised their battlefield command skills. They also used the Laser Tag system, which records hits from laser-equipped rifles. 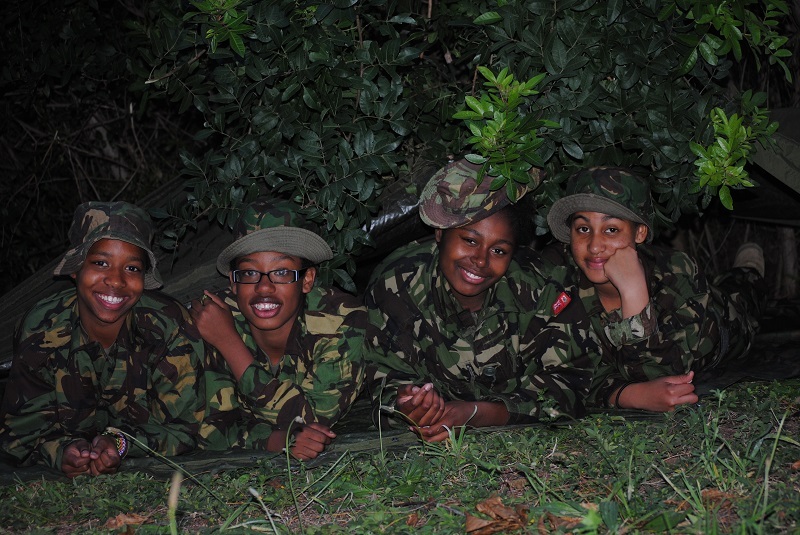 Junior Leaders’ Lance Corporal CaVon Raynor, 14, from Somerset, said: “I’ve enjoyed it very much. We’ve been helping the Regiment doing section training – I was hiding in bushes, waiting until they got close then surprising them. A total of 27 Junior Leaders, as well as adult instructors and parents, took part in the exercises, held from Friday night to Sunday afternoon. 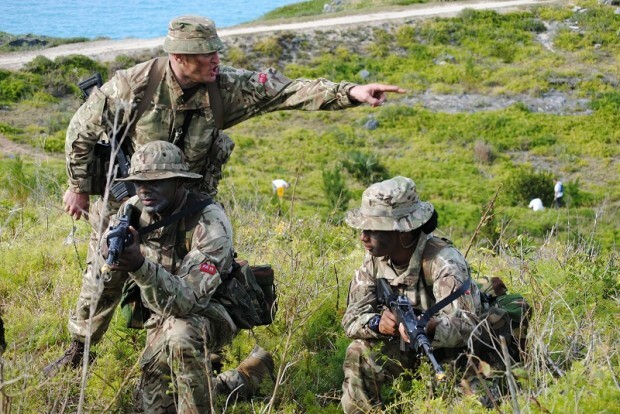 Junior Leaders Commandant Major Henry Campbell added: “We have had a surge in applications, which is good. The more experienced ones now have to supervise and manage a group, so they’re learning a lot. 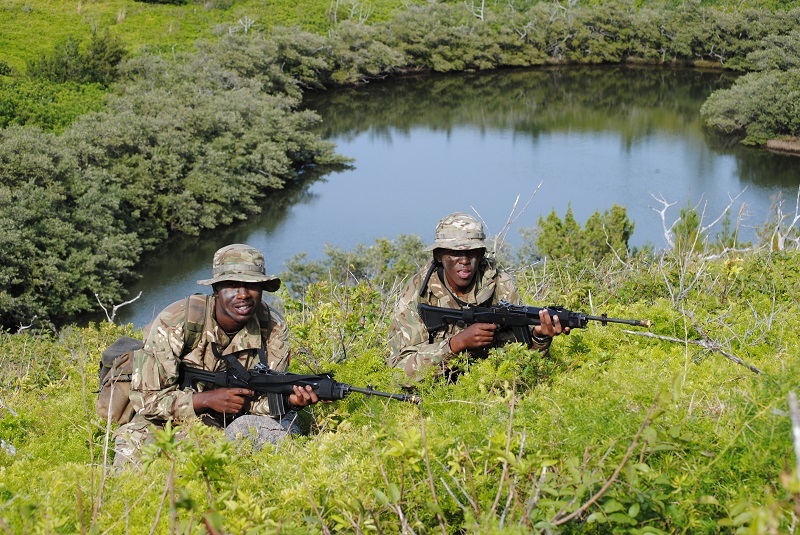 The Junior Leaders worked alongside the Regiment’s Potential Junior Non-Commissioned Officers (PJNCO) cadre, who were practising simulated section attacks and fieldcraft. Private Otis Nelson, at 47 one of the older volunteers, said: “I’m learning a lot and learning new things. I get a lot of encouragement from the youngsters and I try to encourage them as well – they call me ‘uncle’. Regiment Captain Preston Gill, a former officer in the Canadian Army, said: “They came off recruit camp and this is very challenging. They have to learn how to be an infantry soldier and a commander – it’s more than other armies would expect from their soldiers. 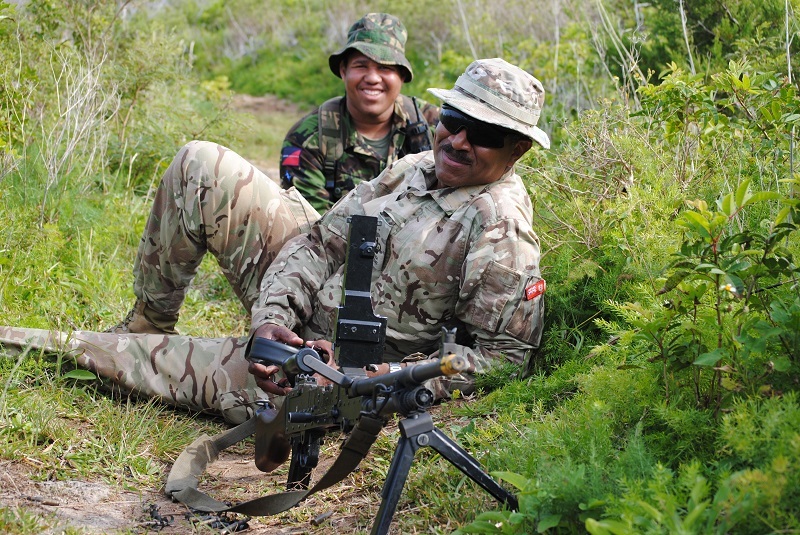 “We have a good mix in the PJNCO, including Bermudians, non-Bermudians and four women, who are doing very well. We’ve got people from the professions and others who don’t have a job at the moment. Its good to practice just in case we get invaded by … by … by … Russia or Osama Bin Laden or something. You never know … it COULD happen. And we might be able to hold them off for two or three minutes. I think what the junior leaders is doing is great, but they are not the only organization on the island there is also the sea cadets who are a branch off the navy and offer the same kind of training but more revolved around the ocean and boating. Another amazing organization. The sea cadets don’t actually do that much training. For a military embodiment (I.e, army,navy etc) for a junior program we do the most military training. Yes the sea cadets do need their props but I think it’s time for the Junior Leaders (former Cadets) to shine. Rather than just the sea cadets. It is very true that the junior leader do deserve to shine, but if i am correct the only reason the sea cadets can not as much training as you is because they don’t have the support from the regiment or government like you do. Keep up the good work guys. The Junior Leader program is an excellent program for young people, they are a great bunch of kids!